Indiana University of Pennsylvania has been selected by Victory Media, publisher of G.I. 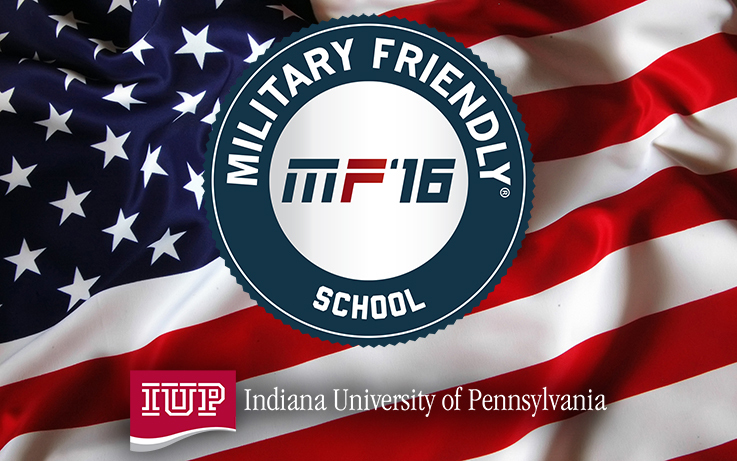 Jobs, STEM Jobs, and Military Spouse magazines, for its 2016 list of Military Friendly Schools. The list, in its seventh year, was compiled through research that included polling schools throughout the nation. Criteria for the Military Friendly Schools list include efforts to recruit and retain students who are veterans or in the military, success in recruiting those students, and academic accreditations. IUP opened the resource center in January 2014 to help veterans and members of the military transition to college life. The university also has a Veterans Affairs office, dedicated to serving student veterans and dependents of veterans. IUP is also a participant in the Yellow Ribbon program, a provision of the Post-9/11 Veterans Educational Assistance Act of 2008 that allows U.S. colleges and universities to enter into an agreement with the Department of Veterans Affairs to fund tuition expenses that exceed the highest public in-state undergraduate tuition rate. Many IUP departments work collaboratively with the Military Resource Center to provide programs and initiatives to help veterans and their families. For example, the IUP Career and Professional Development Center, working with the Military Resource Center and the Veterans Leadership Program of Western Pennsylvania, will host a resume-review training to help veterans “translate” military experience into resumes on November 19, 2015. The event features Leah Kurz, Marine veteran and a workforce development coordinator with the Veterans Leadership Program, and Khrysta Brown, a member of the Army Reserve who served in Afghanistan. Brown, who will graduate from IUP in December, is a human resource specialist at Peoples Natural Gas who was served by the Veterans Leadership Program of Western Pennsylvania.